In 1859, the Paris-Strasbourg Railway Company began service on a line that required elevated tracks from the Place de la Bastille to the eastern reaches of Paris. The railroad's brick-and-stone viaduct carried suburban trains until the 1970s, when newer SNCF long-distance routes and the new RER "A" commuter line made it redundant. 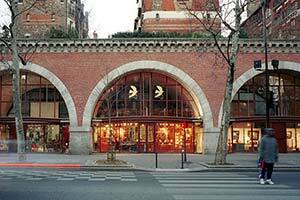 ABOVE: Le Viaduc des Arts has shops, galleries, and other businesses within its 64 arches. INSET BELOW: La Promenade Plantée is on top of the viaduct. A few years later, in the early 1980s, city officials debated whether to tear down the old viaduct or convert it into a pedestrian promenade. The walkway proposal won, and by 1994, the Promenade Plantée from Bastille to Reuilly was open to the public. The next stage was to covert the old vaults beneath the rail line into exhibition spaces and, ultimately, into a series of craftsmen's workshops and galleries. Today, the restored railroad viaduct--renamed the Viaduc des Arts--houses cabinetmakers, musical-instrument makers, fashion designers, textile restorers, and other businesses related to the arts. For tourists, the Viaduc des Arts and the Promenade Plantée offer a chance to take a break from city sidewalk and street traffic while seeing how historic preservation and modern urban-design objectives can work in harmony. When you walk the 1.5-km or 1-mile distance between Reuilly and Bastille, you'll understand that Paris is more than a city with a history--it's a city that continues to develop and grow, combining the old and the new in ways that can bring excitement and vitality to neighborhoods that are off the main tourist circuit. The Viaduc des Arts runs from the Opéra Bastille to the Jardin de Reuilly. The nearest Métro stations are Bastille (near the opera house) and Montgallet or Dugommier (at the eastern end of the viaduct, near the Jardin de Reuilly). The Reuilly entrance is also within walking distance of the Gare de Lyon and (more conveniently) the Gare de Paris-Bercy. Stairways lead from the sidewalk to the Promenade Plantée at various points along the Avenue Daumesnil (which parallels the viaduct), so if you prefer, you can just head for the avenue, explore the ateliers and galleries in the vaults, and wander upstairs to the landscaped walkway when you're ready for a stroll or a picnic. For more information, see the Viaduc des Arts Web site and view our photo tour of the viaduct and its elevated walking path. Main photo copyright © Paris Tourist Office. Photographer: Amélie Dupont. Top inset photo copyright © Paris Tourist Office. Photographer: Arnaud Terrier.